Since November 17, 2009 I have been keeping a journal – very much off and on – that I have titled “Things Dad Learned” for Jack Searby. Today, I was writing in one of the last pages of the journal so I decided to flip back through it and read a few entries from the past 6 years. What ensued was a lesson on the power of reflection. Looking back across these entries that are intended to be shared with my son when he heads off to college, I came to realize something in a very powerful way: it is very difficult for us, in the moment, to realize the insignificance or gravity of a situation. Two examples drove this home for me. I came across an entry where I put on paper a very emotional passage about how trying my son, who was 4 at the time, was being to his mother and I. It was laden with a ‘woe is me’ tone about how hard he was making life by being overly emotional and getting in trouble at pre-school and on and on. As I look back on this, I almost have to laugh at how trite I was being. Jack, at age 4, was a new brother, in a full day pre-school because both of us were working full time, dealing with me being on the road a lot for work, and he was 4! I know that I thought it was a big deal at the time because this journal isn’t a “recap of my day” type of ledger. But with the passage of time and maturing of both Jack and I, it is obvious that the moment was insignificant in the grand scheme of things. It made me wonder what things in my life today I’m making more out of than I should. What “stresses” in my life today should I just let go of because they will seem so silly 5 years from now? The second example was a series of entries that focused on a fear that I was moving too fast with a small business that I had started and self caution to not overextend myself financially with the venture. They were almost footnotes to their posts, but showed up 6 or 7 times over a 6 month period, as if I wrote them as reminders. Reflecting back, I now realize the gravity of those self-reminders and wish that I had recognized their wisdom. Instead, I plowed ahead on emotion pursuing the dream of owning a successful small business with little regard for the larger financial picture. Because of my blind faith, it all came crashing down – the business failed, we closed up shop, and I left a trail of financial wreckage that had to be dealt with (and is still being dealt with). THIS caused me to pause as well and consider what seemingly ‘little things’ in my life seem to be continually itching me that I need to pay closer attention to? I have been feeling my age lately and telling myself I’ve got to be more moderate in my diet and portions. I keep telling myself that I need to be more gentle and caring in my conversations with my kids. I regularly come back to the idea of dwelling on the joy in my life more and sharing these joys with my wife. These nagging thoughts may carry more gravity than I realize…and I probably won’t know for sure for years. 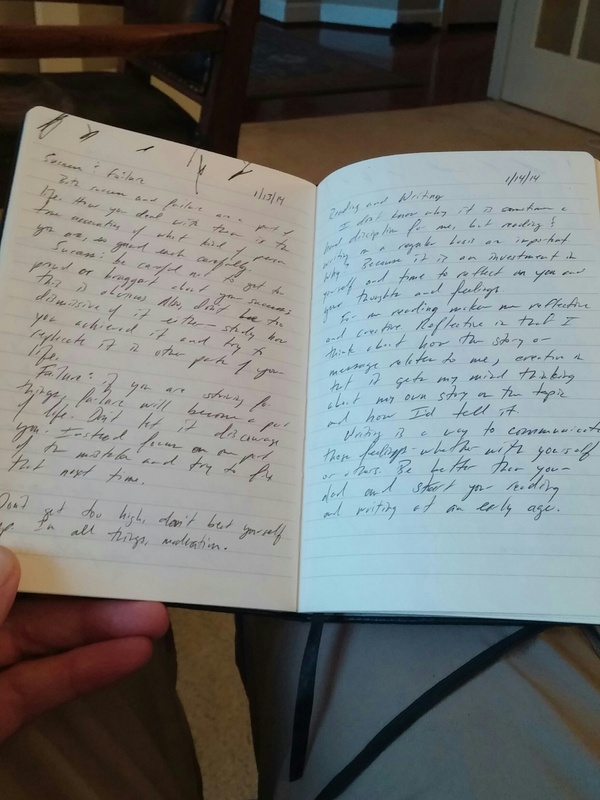 The reflection on my journal was healthy. It made me realize that I still have a long way to go to being the man I want to be and that I keep repeating some of the same mistakes. But it also made me realize that I have grown a lot in the past 6 years. The key will be what I do with these realizations over the next 6 years. Today I will take a step towards joy and gentleness in hopes that those small things carry great weight. I wish that I could say every morning I make time for prayer, quiet, and reflection, but I don’t. This morning, however, I did and a phrase popped into my head that had never been there before – Courage to step away from the work. The context of this phrase came as I was thinking about, and praying for, my brother and several friends who are going through periods of intense work pressure or work-related stress in their lives. While each situation is very different, all seem to be wading through an overwhelming stream of work, an uncertainty about a work future, or a dissatisfaction with their current work that they can’t seem to escape. As I asked a blessing for strength on them, it dawned on me that they probably don’t have the strength to endure these situations. Work can be both intoxicating and addicting, leading us to feel like if we just put in 30 more minutes tonight or return 5 more emails or complete one more report we’ll feel really good. I know this to be true because I’ve been there. I’ve sent emails to colleagues at 8 o’clock on a Friday night when I should be enjoying a movie with my family. I’ve texted my wife that I won’t make dinner because I have to finish a project. I’ve returned to my desk before bed for a few hours of “uninterrupted work” only to find that I can’t sleep because I got my mind racing with the things I have left undone. And I still do these things on occasion. So today, my prayer for myself, my brother, these particular friends I have in mind, and anyone else that thinks they have too much work to do to relax is this: I pray that we will have the courage to step away from the work because the work is not worthy of our worship and it is robbing us of our peace and joy. I fully appreciate that hard work is necessary and I even believe that work can be an act of worship and praise. However, our culture has placed an undue value on “putting in time” at work. My technology makes me completely accessible to my colleagues in Portland, OR, Australia and Europe any time I allow it. If you look at the time zone map, you’ll see that as a worker in the American East, working for a company based in the American West, with colleagues and projects going on in both Australia and Europe, I could, theoretically, work 24 hours a day and be engaged during someone’s work day that needs me. I choose not to do that. Instead, I choose to focus on engaging with my far flung colleagues only in thoughtful and meaningful ways. This sometimes demands that I hop on a call with Australia at 11 o’clock at night or support a conference call with European clients at 6 in the morning. Last night it meant an important phone call with a team member in Portland, OR at 8:30p my time as he drove home from work. The key is that I focus on MEANINGFUL interactions. Rather than respond to every email from every time zone every time, I select ones where I can add value. Instead of making myself available to anyone who wants me at any time, I define my availability based on when I can be attentive and engaged. And often, I spend time during my typical workday here in the Eastern Time Zone doing things that are personal tasks, family obligations, self-improvement, or just fun. It takes courage to step away from work, but it is wholly necessary. The word courage is defined by Oxford as “the ability to do something that frightens one.” Walking away from the work definitely frightens me. It can be terrifying to think about what Monday might be like if I don’t check off everything on my Friday list, or what my boss might think if I don’t respond to his email within 5 minutes on a Sunday night (which is Monday morning in Australia), or how a client might react if I don’t pick up their phone call from California at 6pm Eastern time as we are sitting down for family dinner. Still, we must act in the face of that fear and walk away, hit ignore on the phone, or shut down the email. You see, while we all inherently know that we need space in our lives for fun, family, friends, hobbies, or relaxing, we somehow give these things second class status to work. So we press on, trying to squeeze work into every nook and cranny of our lives. All the while, we are missing out on the joy that comes with allowing space and time into our days. So if you’re feeling overwhelmed by your volume of work today, stressed out about your work situation, or just looking at a to do list that seems insurmountable, have the courage to step away from the work. Unless you are a surgeon, it is unlikely that anyone will die from you not getting back to them or not attending to their need (want). Don’t fill your time away with anything that even feels like work. Instead read a book, go for a walk, sit at a bar, talk to your spouse, enjoy your backyard, or just sit quietly. You’ll find that not only will the work still be there, but you will be refreshed and re-energized when you return to it after your courageous hiatus. Last week I had the opportunity to visit Georgia Tech and Clemson University for work. While it isn’t uncommon for me to be on college campuses in my job, these trips were a bit unique in that I had some down time between meetings at each place which allowed me the chance to walk around both campuses a bit on beautiful late summer days in the South. 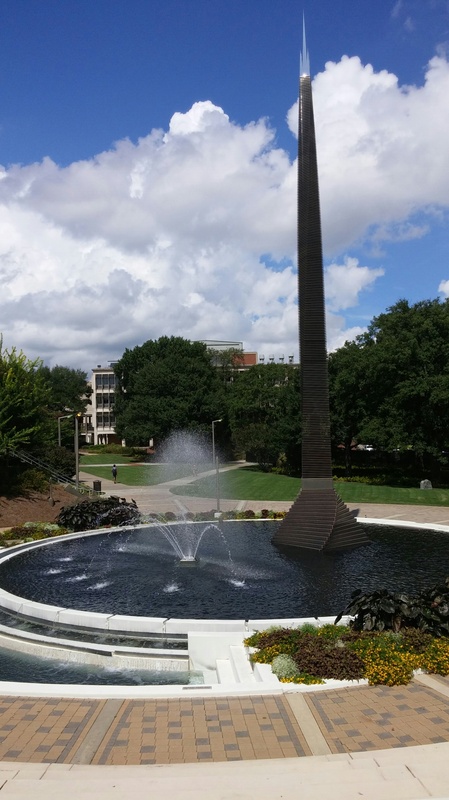 While each school has some beautiful spots (like the fountain above at Georgia Tech), it wasn’t the natural beauty that struck me. What really stood out to me was how energizing college campuses can be. There was a buzz in the air as I walked around amongst the 18-22 year olds in their environment. Yes, I did realize how old I’ve become as I noted the differences in fashion, language, and fitness level. Sure I had a few moments of angst as students just walked right out in front of my car in the middle of the street because that is where they wanted to cross. And I certainly had some trepidation for our country when I saw the frat boys slamming beers on the front porch of their house at 2 in the afternoon. But those things just come with the territory. What I had forgotten in my nearly 20 years out of college is how much hope, optimism, excitement, blissful ignorance, and energy can be found around university students. The highlight of my trips last week was the opportunity to speak to a Sports Marketing Class at Clemson University. Far from dis-engaged, the students seemed interested, asked good questions, had insightful comments, and a few even hung around to talk after class. I was on cloud 9 the entire drive home. There is something about young adults, aspiring to be professionals in your field, listening and soaking in your instruction that makes one feel like they are important. Over the past few days, I’ve been mulling over why I had that reaction to these experiences back on campus. I think certainly there is some nostalgia about my own time at Milligan College. My time tucked away in the mountains of East Tennessee, making the best friends of my life, and learning how to learn were some of the most formative and impactful years I’ve experienced. I remembered back to the carefree feeling of early fall days when classes were over and basketball practice hadn’t yet begun or the springtime when a Friday afternoon meant taking off early (and maybe even skipping a class) for a camping trip. I’m sure part of my euphoria was also connected to the 10 years that I spent on college campuses as a basketball coach and athletic administrator. I met my wife on a college campus and our lives, both personal and professional, revolved around those schools and their athletic departments for many years before our own kids came along. We developed intimate relationships with the coaches and student-athletes we worked with, and developed passions for the schools where we worked. Still, I think it is the optimism I sensed that excited me the most. Unlike our adult lives that often grind on endlessly from week to week and month to month with no beginning and no end, college has built in points of reset. The start of school in the fall is a chance for everyone to have a clean slate with no grades in place, no interpersonal fractures with professors or friends, and a fresh start. Every year there is a new crop of freshmen experiencing things for the first time, which adds to the excitement. Most schools have a fall break that is the end of the first big push of the year, and when you come back you start focusing on getting the first semester wrapped up. Then it is an extended Christmas break time for family, football bowl games, and a time to decompress. The Spring semester gives you the promise of new and different classes, established friendships, and the pursuit of an internship or other summer activities. By the time Spring Break rolls around, you’ve pushed yourself to have a good start and you come back from a week of fun in the sun to finish the school year with 6-8 weeks of either hanging on in your classes or throwing in the towel. The end of the semester may have angst and anxiety, but after a week its over and there isn’t anything you can do about. All that is left is to move on to whatever personal or professional opportunities you’ve lined up for yourself in the summer, where if you’re lucky you get a 3 month ‘test drive’ of something you think you want to do for the rest of your life. Then you walk away from your summer fun/work, wash your hands of it, and start the cycle over. How could you not be optimistic if every 3 months you got a ‘reset?’ It is no wonder that there is energy permeating from college campuses. Rather than starting each week looking at last week’s sales report and worrying about how this week will impact next month, every week holds the promise of its own new challenges with little regard for last week and certainly no concern for things months from now. Instead of facing the same 8 am start and 5 pm end to the day Monday through Friday, college schedules are random and scattered with some classes meeting 3 times a week, others 2, a few one day a week, and an intensive seminar now and then. Some days your first class is at 8, sometimes it might be 10. When Friday rolls around all you think about is yourself, not chores around the house or kids’ activities. If you go through a semester and struggle with a class, its over in less than 6 months and you redirect things to an area where you’ll find more success; think about the opportunity to do that on your work projects! For me, being on these college campuses was a great mental reset. It not only made me grateful for my own college experience, but it got me thinking about trying to borrow some of their optimism for my own life again. If you haven’t been on a college campus in awhile, I’d strongly encourage you to go – go back to your alma mater for Homecoming, volunteer to be a guest lecturer at a local school, or go to a random art or sporting event at a nearby school. Park somewhere on the edge and give yourself some time to walk the campus, hit a coffee shop, or stop in at the student union. Then sit back and ask yourself why you shouldn’t have the same optimism as the students you see around you? My grind is only a grind when I let it be that way and so is yours.